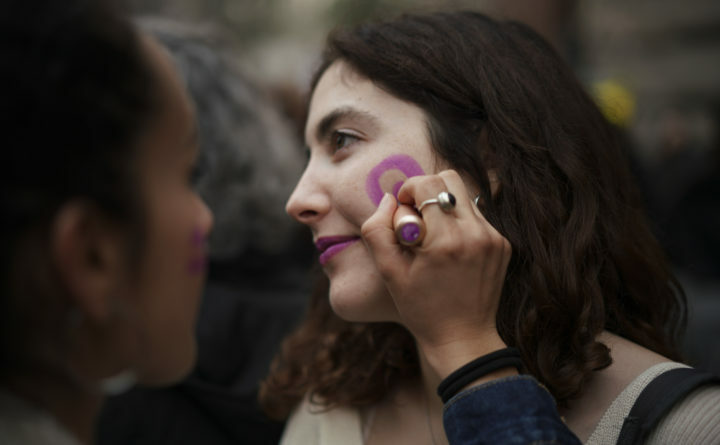 A girl has her face made up during a demonstration to mark the International Women's Day, in Rome, Friday, March 8, 2019. The day, sponsored by the United Nations since 1975, celebrates women's achievements and aims to further their rights. Women continue to be major contributors to the U.S. labor force, with 58.2 percent of those age 16 and older participating in the job market. That’s just one of the statistics the U.S. Census Bureau released in a nod to International Women’s Day on Friday, March 8, and to Women’s History Month during March. The data were culled from various sources, including Vintage and the American Community Survey. Women comprised 43 percent of the total U.S. workforce in 2017, with men at 56 percent. The gender pay gap is closing, according to the Census Bureau figures, but it remains. Women get 80.5 percent of what men make. So a woman would make $41,977 in 2017 compared to the equivalent $52,146 a man receives. The biggest field for working women is health care, with close to 73 percent working those jobs. Another 62.5 percent are in education, 39 percent in management jobs, and 24 percent in engineering, computer and science jobs. In terms of educational attainment, about 34 percent of white women had a bachelor’s degree or higher. For black women, the rate was 24 percent. Close to 52 percent of Asian women held higher education degrees. And close to 18 percent of hispanic or Latino women did. One in 12 women is a veteran. There were 165.3 million women in the United States as of July 2017 and 160.4 million men. The older women get, the fewer men are still alive. The approximate ratio by which women age 85 and older outnumbered men in 2017 was two to one, or 4.2 million women to 2.3 million men. National Women’s History Month started informally March 8, 1857, when women from various New York City factories staged a protest over working conditions. Congress established National Women’s History Week until 1981, to be commemorated annually the second week of March. In 1987, Congress expanded the week to a month, according to the U.S. Census. The first Women’s Day Celebration in the United States was in New York City in 1909.